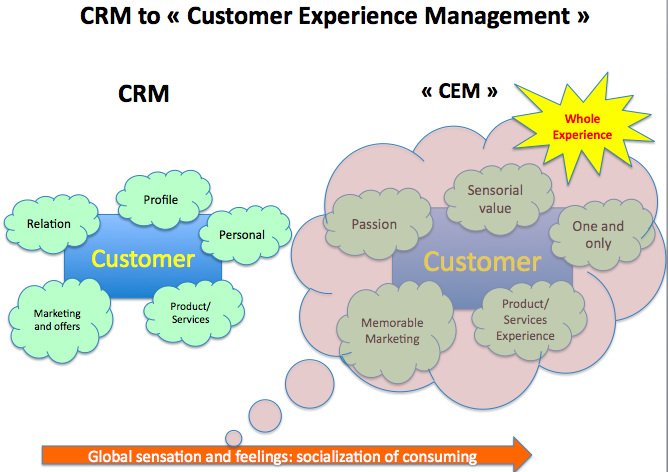 And if the next CRM concept was “Customer Experience”? 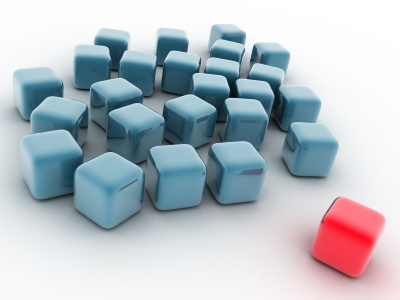 Don’t run to imagine your next product or service, maybe it already exists. And maybe the next big picture is about “experience”, more than delivering…While brands always search to surprise customers, dealing with trend and fashion, there’s probably much more important elsewhere…Not really elsewhere but in another register…sensation, feelings…experience. And if you start to think about being more “sensorial” in your approach? In a famous outpost called “the experience economy” in Harvard Business Review, some guys (Pines/Gilmore) compared business as a “stage” and work scene, a theatre. Business like a movie? The only difference is that everybody is an actor, sometimes consumer, sometimes not, but anyway, trying to get some sense with brands. Sense means “a reason to buy” or a “willingness to be caught”. Beyond innovation, brands must reinvent the way they do business, throwing away the natives and early concepts of “mix marketing”, as mainstream tools, where consumers are not trapped anymore. In fact, it’s really easy to “create, brand, promote and deliver” a product and service, with teams, money and resources…(tip: it should, I must admit sometimes you run nut with several offers and customer services but…). But revealing a sheer experience, the one who everybody is gonna be fool of and spreading the buzz all over the world, say that we talk of more scarcity, isn’it? That’s what now brands spend their times, caring about anything is around service and product to wrap the whole offer in an unforgettable shot. And yes, probably social web gear up the movement as it facilitates the “opinion” circulation all over online tribunes…And we see that all these opinions take part of the “whole experience” of a brand delivering. See how good or bad advises are posted each day, just only on foursquare for example, on places you have to visit or…avoid. Zappos’ delivering happiness concept seems to be central and in DNA of this company. They don’t just “deliver”, they make you “feel”, that something happens…I know it can be a cloud vision, but it adds a kind of huge “goodwill” and friendness to the brand. And probably rise the loyalty and the virality of the shopper…(and finally can we still and only say “shopper” to these “skills” or company object?). Because the difficulty stands on “defining the role that the brand plays and how it takes place in a global value chain and needs awareness”: we see that it can be resumed only to deliver a service or a good. It’s about delivering “memorable and engaging experiences”, and I would say “sustainable” to customers. And saying these simple few words is a matter of complete transformation in companies. If company wishes to do so, everybody is responsible to achieve such a thing: from calls, accouting, to supply, sales and IT. 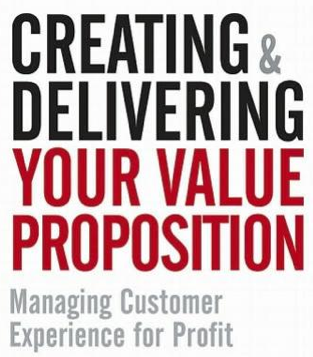 It becomes the main “strategic intent” of companies, through they are going to play their marketing leverages, serving the value purpose. Customers in fact are not outside anymore…they are the blood and the guts of every employee, whose can feel in each of their actions, the “why” and the reason-to-work as a daily behavior. Experiencing such situations is governed by the sheer pleasure: surprise, care, use and pride. In fact, it’s not a job, it’s a cause! Any company should drive his business according to the only fact, they serve a “cause” (yes even if there’s a reward and we don’t talk about not for profit). So the “design of experience” is central and finds a footprint in everything in relation with the product or the service: packaging, baselines, design, guide, helpdesk, accessories, delivering, after sales, loyalty care, surveys…In fact, any product or service comes with an experience and it’s the role of marketing to improve it and develop the “sensory experience”, to rise value, yes for company but also to hold a valuable experience for customer. The one they won’t forget and spread the new everywhere. The one that really builds a strong loyalty, envy and customization. Considering this, any company or brand should now build a whole “customer experience strategy” to enhance loyalty and shift to value. And this means involve every function or person inside the company. Company that would build no products, no service but “experience” and customers…If we stare at memorable brands (Apple, Dell, Zappos, Amazon,…), we can surely say that they built a strong community around them, who spread the word and takes place as a whole experience marketplace. We probably assist to a change in CRM concepts as Brian Solis said, like sCRM, enhancing the experience effect into the global offer. 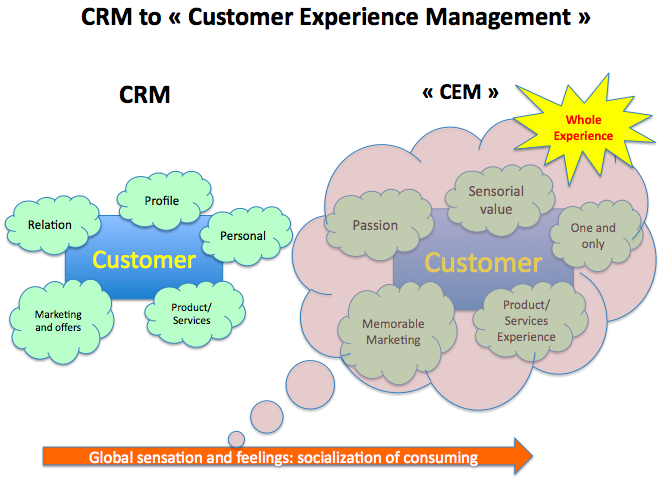 CRM to “CEM” (Customer Experience Management), that can create a new angle to see customers, serve them and make them central and ambassador of the brand. Being “central” means that customers are in the same office than you, they take coffee or break with you, go to lunch, and work on the same topics. You see now? Design for customers by customers, one experiencing what he wants to buy. What social web did, covering posts, opinions and facts written by customers themselves, targeting brands, is now a real shift for companies. Preparing, designing and customer mindsetting is part of the next “profiling” to shape a better “experience”, to deliver and raise customer loyalty. This experience value could be “the willingness to pay, for ‘feelings’, using a product or a service”: which difference would you be ready to pay to feel a memorable experience? If we can mesure and give a value to “experience”, then companies can build a P&L and focus resources to transform their whole relation strategy. I think it will really and definitely make a difference, a kind of skip out of the box, an step forward innovation for leading mindset and customers fan. Let’s imagine about the next pushing button of Facebook’s badges…”I experienced”. Social web and the new play for information has scrambled rules of former process for distribution of power and information. The simple idea, in thinking that “one”, at the peak of the pyramid can hold now all the power is so stupid…And this concept may be extended to “A-list”, so called influencers, while we figure out and dream that they can decide for your future (eg your company or your products), or decide of your life or death. In fact, we must not focus on this dumb fake reality, not that they are not listened or respected, nor they don’t have any influence, but they don’t have the monopole of spreading the buzz. And some may be more effective than ever…You see? You guess? You bet? You. You as a customer, as a simple citizen. Anyone has a circle of reference, value and thinking and influence his own private circle. And that’s the mass, the so called “mass marketing” that can be more effective and buzzing, than a happy few “top of pyramid”, who turn around together, recycling their ideas, comfortable with a “kind of mindset”, sometimes unplugged from reality. As you start to meet some social nodes, you’re in contact with a whole ecosystem of information, that leads you in a kind of influence as well. And those little stones you grow make a silent but strong way to a certain kind of influence. Fastcompany tried to mesure the randomize influence of lots of people, in launching the influence project. ThoughtLead, another social agency organized the shortest trial, for influence thinking, in creating shots for 60 influencers, in short talks or thoughts, for a 60 minutes session. Another way to spread quickly a fast debate on many influencers mindset. What I found in all these projects is that small groups around a simple topic get their way to a particular sport of influence…So big bloggers can drive you fast and high, but there’s nothing more efficiency than the “long tail of influencers”. Finding your own local circle of passion, chat and meetings can assure you a long and constant effect, sustainable. And that’s brighter than a short shot with a passing star: could a “A-list” start remind you, even if you spend a while with him/her? I probably say no. Influence is a complex concept, that means that the thing to be influenced is ready for it, and the noise and environment too. Readiness of the market and regular word-of-mouth with local folks can rise you far ahead. Buzz is so unpredictable that you’d rather trust on constant and flowing network than stars that shine only one day…Remember next time you’ll meet a A-star, not to wait too much, but taking a good time, as any link to your personal network: you’ll receive only what you’ll give. In this forest of “friends”, forget about the so called leaders and follow your intuition to build your own 6-degrees-of-separation scale of influence. And start by doing your best as a link to listen and spread any comment, thought ou idea you find interesting. Influence is not a passive state but a real job…in building strong and sustainable relations with active and solidary members. The human web is endless link to more humanity, friendness and care for others. Influence starts as you do something for free…just for pleasure. A viral pleasure.